Last week Gunnison hosted a Gun Show at the Jorgenson Park. At this show they had several gun dealers with a many different types of fire arms on display. Gunnison has its own display of antique guns. This display is one of the best around. The Pioneer Museum has several different types and models of guns from the Civil War, World War I and World War II era. The first rifle (pictured above) is a Springfield rifle 1873. This rifle was used in the Civil War. This rifle along with two other rifles were donated by William and Patsy Ender. Don Fisher donated several rifle and guns to the Pioneer Museum in May 2009. The rifles are from World War II era. There are Rifles from the United States, Germany, Japan, China and Italy on display. The WWII American imitation rifle was made of wood with a Training Bolt-Action was used for training of American troops due to a shortage of the real rifles at the beginning of WWII. The American Winchester M-1 Garang Manufactured was used in 1941 to 1945 during WWII. You will see a WWII German “Mauser M98 KAR” Bolt-Action Rifle with Grenade Launcher, 2 Muzzle Covers, 2 Grenades and a Parachute Flare with Leather Case with a Nazi symbol on it, all used in 1941 to 1945. There are three rifles used by Japan in WWII. The first is a Japanese “Model 44” Bolt-Action Rifle with a Folding Bayonet during 1941-1945. This model was developed and manufactured 1911. There is a “Chrysanthemum” symbol stamped into the top metal section just in front of the dust cover. This is an extremely rare symbol. They also used the 38 Carbine rifle with bayonet and Brass Muzzle Cover. The “Model 99” Inc Mono Pod Rifle with Spigot Grenade Launcher was used from 1941-1945. WWII type 53 Soviet Model 1944 Mosin Nagent Carbine Bolt-action Rifle with attached Folding Bayonet. WWII Chinese Mauser M98 Bolt-action rifle with bayonet. One of the rifles that Russia used in WWII was Nagant Type 53, model Bolt-action rifle. They used this rifle in 1941-1945. A rifle used by the Italian in WWII is the Italian Carbine M1901/24TS (Mannlicher) Bolt-action Rifle, used during 1941-1945. The Pioneer Museum is very grateful to Don and Chris Fisher for all of the donations that they have made to the museum, it sure makes a BIG difference IN THE MUSEUM. These are just a few of the rifles and guns on display at the Pioneer Museum. If you are a gun collector or just like to look at different types of guns this is a one of a kind gun collection. There are very few gun collections of this quality. 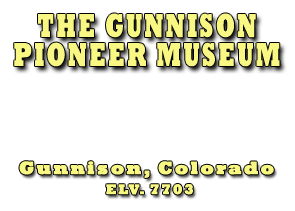 We would sure like to invite everyone to come and spend a few hours with us at the Gunnison Pioneer Museum. It will be surprise for you to see what Gunnison and the people were like in the first 100 years of Pioneer time in Gunnison. The Gunnison Pioneer Museum and Society is always accepting volunteers and members. IT IS OUR PRIVILEGE TO INVITE YOU TO JOIN US AS A MEMBER AND VOLUNTEER OF THE GUNNISON PIONEER MUSEUM AND SOCIETY!!!! When you are here for the All Gunnison High School Class Reunion, (August 7th, 8th and 9th), take a break from all of the goings on and go to the Gunnison Pioneer Museum and see some of the cars that were running around town when you lived here. Look at some of the pictures and buildings on display, they could bring back some very happy memories while growing up and going to school. Don’t take a second look at the volunteers working you might recognize some of them as past class mates.